David Wood is an American author of action-thriller, adventure, fantasy and speculative fiction novels. He writes the Dane Maddock Adventures series as well as The Absent Gods fantasy series (as David Debord). He enjoys history, archaeology, mythology and cryptozoology. His favourite books include Pendergast by Preston & Child, the Dirk Pitt books, anything by James Rollins and Robert Jordan‘s The Wheel of Time. Notes: The novella Callsign: Queen is written alongside Jeremy Robinson. Into the Woods is written as David S. Wood. 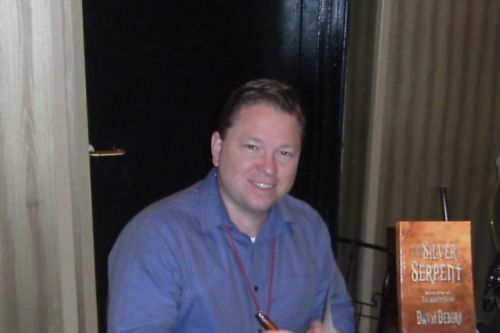 The Absent Gods series and the anthology Dark Places were written as David Debord. Freedom was co-authored by Sean Sweeney. Hell Ship was co-authored by Sean Ellis. Splashdown was co-authored by Rick Chesler. Dead Ice was co-authored by Steven Savile. Dark Rite was co-authored by Alan Baxter. The Sam Aston Investigations series is written with Alan Baxter. The Dane Maddock Destination Adventure and Elementals series are co-authored by Sean Ellis. Berserk is co-authored by Matt James. Devil’s Face is co-authored by Stephen John.